The Blau Colonia Sant Jordi Club hotel is built on 80.000 m2 of land with patios, gardens, fountains and lakes, within 400 m from the restaurants, bars and shops of the resort centre. 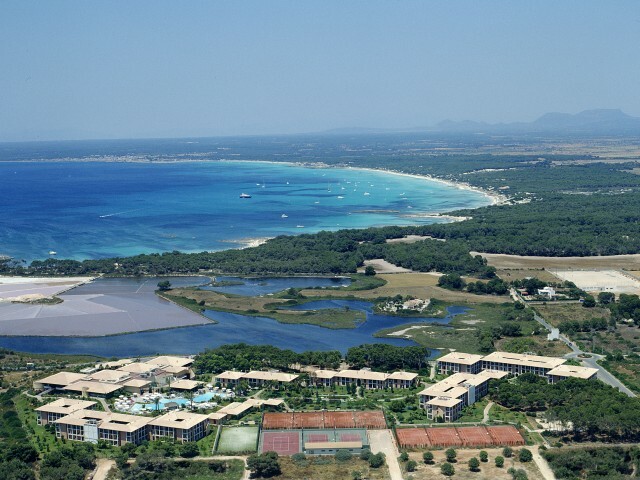 The airport is approximately 45 km away and the capital Palma is 50 km to the west of the hotel. The hotel facilities and services include reception, restaurants, lobby bar lounge, conference room, snack bar terrace on summer night with live shows, indoor pool (from 01/10 to 15/05), outdoor pools with children´s section, sun terrace with pool bar and Spa with sauna, Jacuzzi and steam bath. It also offers evening entertainment, mini disco and children´s activities, mini club, playground and babysitting service (with extra charge), as well as sport activities such as tennis, volleyball, football, aerobic and aqua aerobic, bowls, darts, archery and shooting, table tennis and fitness room.